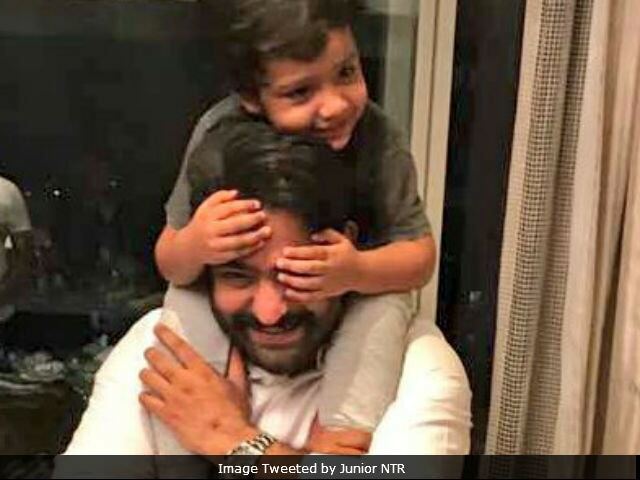 Junior NTR said, "The best thing after my son is my work and he taught me to be genuine"
Jr NTR said "The birth of my son taught me to be genuine"
Junior NTR says, "He is proud to carry forward his family legacy"
Actor Junior NTR, whose Jai Lava Kusa released today, says the birth of his son taught him to be 'genuine' in what he does, reports news agency IANS. The 34-year-old actor said, "My son's entry into my life changed the way I saw my career and my general outlook towards life. We keep thinking of what others feel when we do something. I was meant to be an actor and I realised that only after my son was born. I haven't been fully genuine in what I've been doing. The best thing after my son is my work and he taught me to be genuine," reports IANS. Jr NTR is married to Lakshmi Pranathi and has a three-year-old son, Abhay Ram. Jr NTR featured in Puri Jagannadh's 2015 film Temper, which released a year after Jr NTR's son was born. The film gave my career a much-needed high, Jr NTR said. "I needed to have a journey of my own to tell my son tomorrow. To even discuss my journey with my family, I have to set an example. Life needs to be like a roller-coaster ride with ups and downs. Otherwise, it's not exciting," reports IANS. The actor is also proud to carry forward his family legacy as he believes it keeps him grounded and guides him in his career, reports IANS. Jr NTR, who is a third generation star from the Nandamuri clan, told IANS: "I've been given the opportunity to carry forward the legacy with which people associate me. I can't escape it even if I don't like it. I take pride in carrying forward what's been given to me." Jr NTR made his acting debut with Telugu film Ninnu Choodalani, when he was all of 17. Jr NTR said that he believes there's no escape from what he calls the family 'baggage.' "If there's no load on you, no anchor point, we are free souls and we will be roaming around. We end up doing whatever we feel like. The baggage made me realise who I am and it has kept me grounded," IANS quoted Jr NTR as saying. Jr NTR is named after his grandfather - late Nandamuri Taraka Rama Rao - who was known as NTR. He was a popular Telugu actor-filmmaker, who later became the Chief Minister of Andhra Pradesh in 1983. He has featured in films like Naanaku Prematho and Janatha Garage,which received a great response from audience. Of his film Jai Lava Kusa, Jr NTR said, "More than getting excited about playing three characters, it's the emotional angle of the script which got me hooked. This film could be made without the triplets because it's got such potential," reports IANS. He added, "This could have been a nice multi-starrer. But Bobby (director) wanted to make it with triplets and the film was designed on this premise. It's about three brothers. My brother is producing the film and this is a special film for both of us." The actor worked with Hollywood make-up artiste Vance Hartwell (The Lord of The Rings trilogy) for one of the three looks in Jai Lava Kusa. The film has already hit the screens today and receiving a great response.